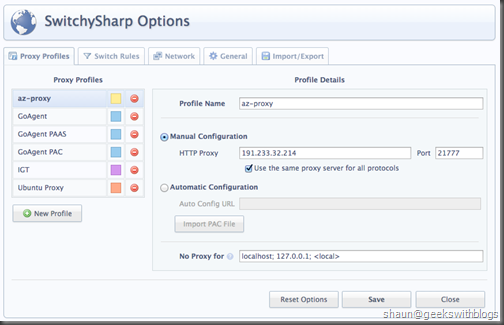 There are many advantages build our own proxy server on the cloud. For instance, in Microsoft Azure, the price is pay-as-you-go, which means we only need to pay when we need a proxy server and turned it on. Second, it's very easy to scale up and down. If the proxy is just used by myself, I can create a minimum virtual machine with small CPU, memory, disk and network bandwidth. But we can scale it up if we need, for example when we need to watch World Cup videos. Last, there are many Azure data centers around the world. This means we can create proxy server in US, Euro, HK, Japan or Brazil, etc.. 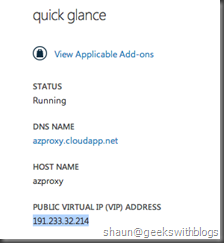 Create a proxy server in Microsoft Azure is very easy. 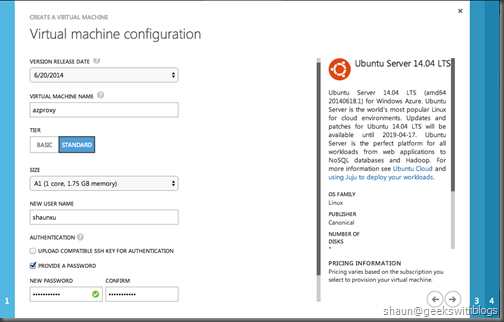 First of all we need to create virtual machine in Microsoft Azure. In this case I'm going to use Ubuntu. Next, specify the name, size and authentication of the machine. Since this proxy server will be use by myself, I specified a small size which should be OK to view web pages. And in order to make it simple I created a user with password rather than upload a certificate for authentication. Next, we need to select a region where our proxy machine will be hosted. In the screenshot below we can find there are 11 data centers in the world. And if you have account in Azure China there will be two more, Beijing and Shanghai. I selected Japan West which is close to me. Then I need to specify an endpoint for the proxy. Just create a new endpoint at the bottom of this page, specify the number you like with TCP protocol. Recommend to specify endpoint number larger than 1024 since in Linux, you must use "sudo" to start an application listening port less than 1024. 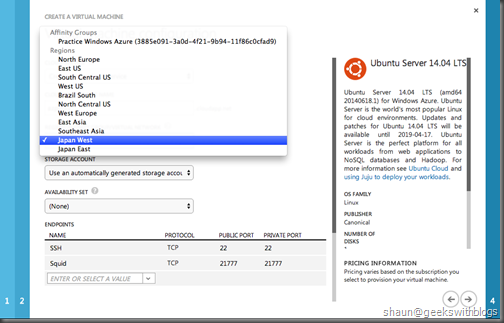 Now let's click OK to provision our virtual machine. 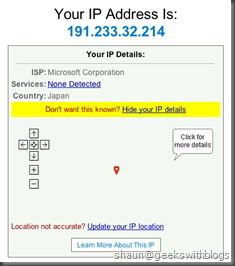 After several minutes when the machine was ready, go to its details page and copy its public IP address. This is our proxy address and it will NOT be change until we stop the machine. Next, we need to login to our virtual machine and install the proxy software. In Windows we can use Putty, an SSH and telnet client. In Mac or Linux there is a build-in SHH command line, that just need to type the command as below. The argument is "ssh [your login]@[virtual machine public IP]", which are the login I specified when created the virtual machine and the public IP I copied previously. 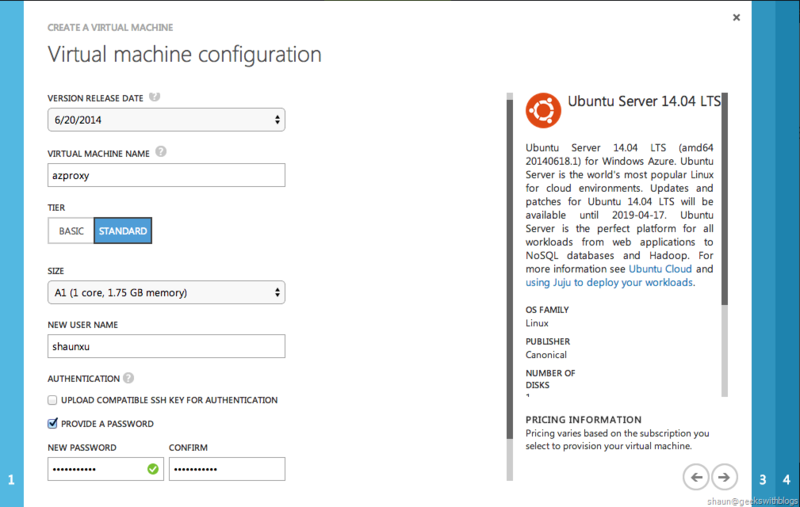 Type the password I specified when created the virtual machine and now we logged into the Ubuntu in Azure. Now I'm going to install the proxy software Squid through "apt-get". After the Squid was installed we will modify its configuration. 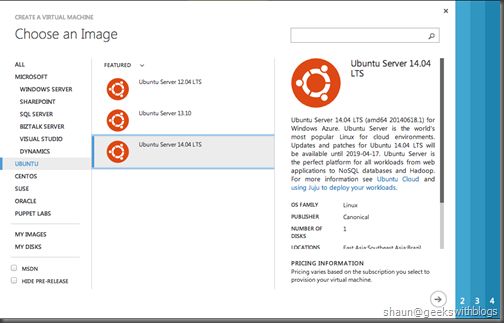 Go to the configuration folder, backup the original one and create an empty configuration file. Then launch "vim" to edit. Just follow the command below. Then in "vim" I will use the simplest configuration, which allows all clients to connect and allows all destinations to communicate. And specify the port Squid is listening, which must be the same one as what we specified when created machine and save it. If you are not familiar with "vim", you need to type "a" to enter the append mode and paste the configuration below. Then press ESC to back to the command mode and press ":wq" to save and quit. Next, restart Squid service to apply our configuration. Then you will see the process ID of Squid. To test our proxy, just back to my laptop and connect the proxy endpoint through "telnet" as below. If you see the message in terminal as above your proxy is up and running. 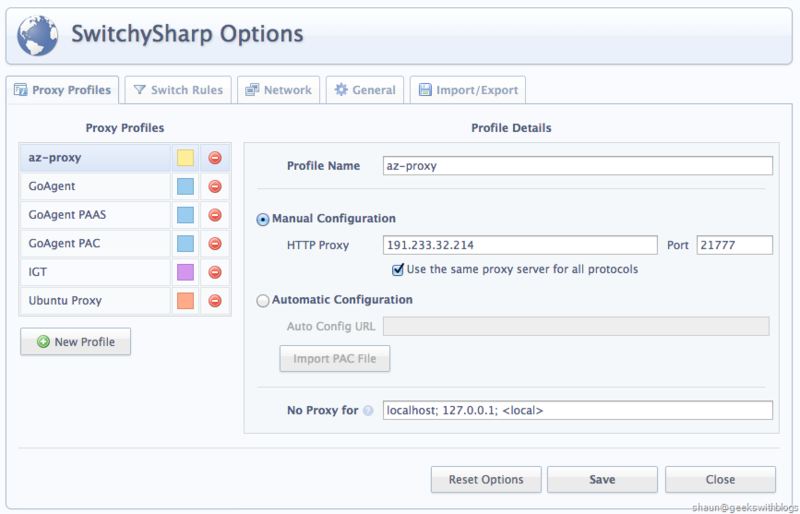 If you are using Chrome there is a awesome extension for smart proxy configuration named SwitchySharp. 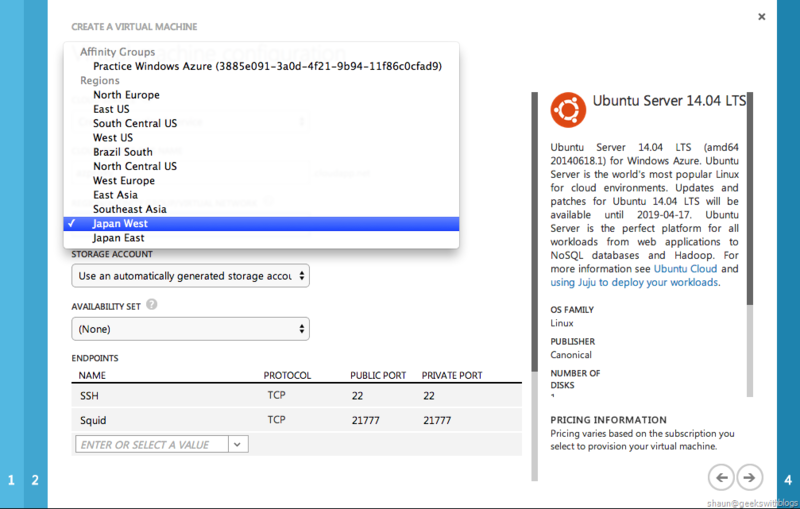 In the screenshot below I specified the proxy setting to my server in Azure Japan. Just copied the virtual machine public IP as the HTTP proxy and the Squid endpoint as the proxy port. Below is the IP detection result. 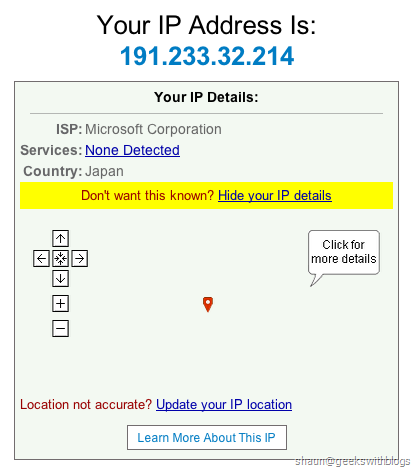 As you can see I'm not at Japan with Microsoft Network. I was struggling trying to get this setup - I forgot about the endpoint! 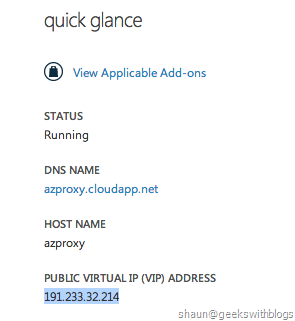 I was using the same config for a proxy server in Azure but I am not able to access to HTTPS websites... any suggestions? 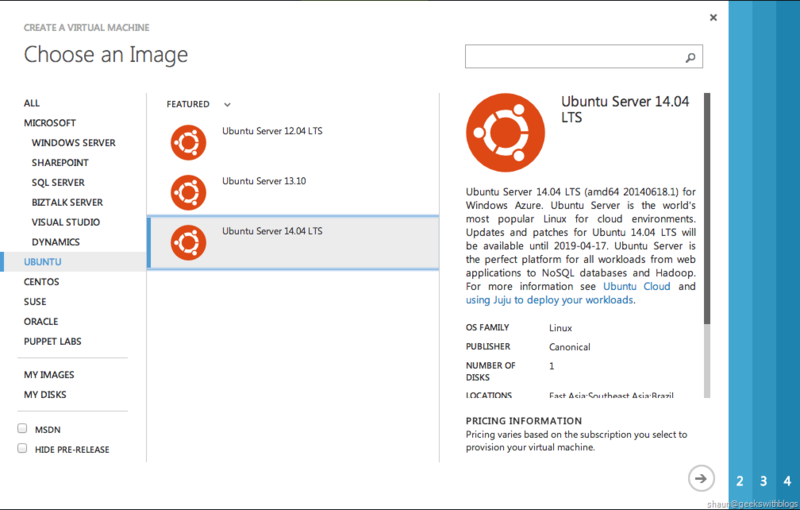 Could you update the screenshots with new azure portal.